You may receive an error message when attempting to connect a Facebook account with a Facebook group/fan page in Instagram. 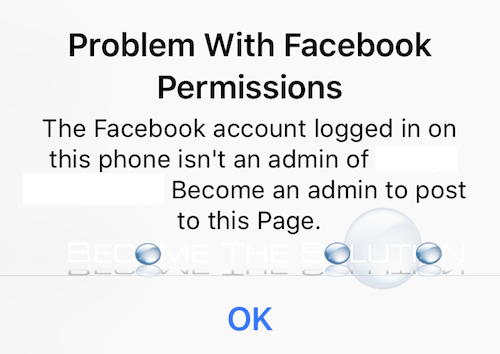 The Facebook account logged in on this phone isn’t an admin of “”. Become and admin to post to this Page. If the Facebook page was previously connected to your Instagram account, it is possible your rights to the page changed or the connection to the page was somehow broken. You will need to reconnect your page through the Instagram app again. Follow the steps below. In the Instagram app, click settings gear icon. Scroll down to Settings and select Linked Accounts. Select Facebook and connect your Facebook account with the Facebook page you are an administrator of. I fixed it from changing the instagram account to personal instead of business. Have had this problem since October. Spent countless hours trying to fix and following every solution on the internet. This is a bug on facebook/instagram, but they don't have good support. I fixed it from changing the instagram account to personal instead of business. Temporary fix Have had this problem since October. Spent countless hours trying to fix and following every solution on the internet. This is a bug on facebook/instagram, but they don't have good support. I am having the exact same problem. I have tried unlinking, uninstalling, reinstalling, relinking etc. It shows that everything is set up correctly but my Instagram posts never share to Facebook and sometimes I get the error message shown above. I have not been able to share posts since October 2018 due to this problem. I contacted FB about it and I basically just got a generic response thanking me for the feedback and advising that they will take it on board to improve for future.